What a dedicated writer Ibrahim is. If only I could be that good. Writing is his escape! The little goober. We’re gonna need a montage! A traveling to Denmark montage! This page IS the traveling to Denmark montage. It won’t take long. Enjoy beatiful landscapes Ibrahim! Love those ships at second panel. What kind of heathen would do something like that, I wonder? This comment reminded me that I forgot to draw the freakin’ knife and I feel like such a doofus. If Coal got his right hand cut off, for thieving, could he just stick it back on? So close! It’s gonna happen! Hard to say about prints and stuff! I do have a Society6 shop with a few things to choose from, they have good quality. WHAT IN THE WORLD COULD THAT BE?! 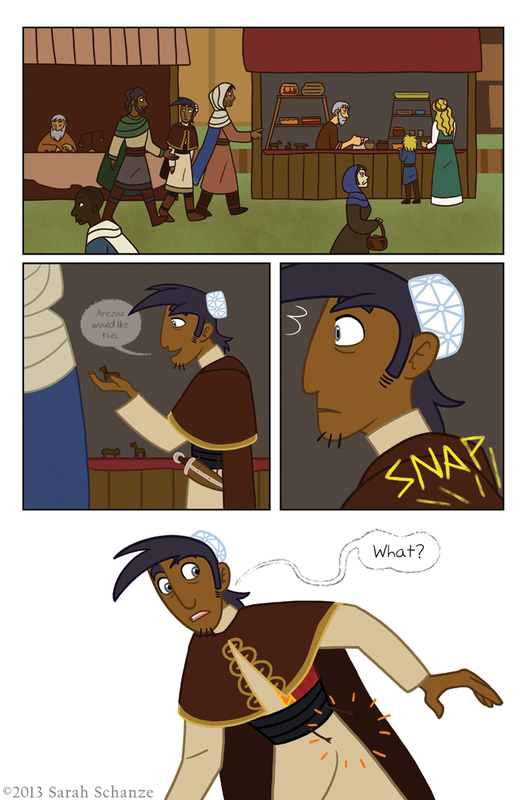 I just want to say, dear Author, this is an awesome webcomic. From the very beggining it got my attention with the whole “Get back our weapons” quest, meeting LokI, and the overall environment of the ancient world. The characters have charm, and the art reminds me of Gendi Tartakovsky. I’ll be checking this comic, hungry for more.